This permanently reliable ZinCo system build-up consists of the following functional layers: protection mat, drainage layer, filter sheet, growing medium and plants. 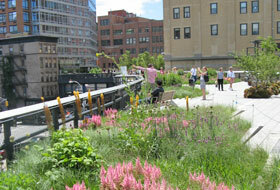 New York's latest sight "High Line" emerged from the abandoned freight rail line – thanks to ZinCo green roof systems. The spacious park scenery at the foot of the Repsol-Towers in Buenos Aires is situated over an underground garage and creates precious space for recreation. 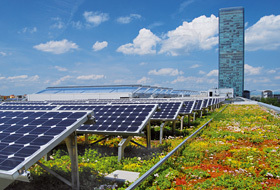 The green roof on the Technology centre in Munich, Germany, increases the efficiency of the solar plant because of the steady cooling of the ambient temperature. The roof of the shopping mall "ES" in Esslingen, Germany, proves that trees can grow on roofs, provided the statics and the system build-up are suitable. 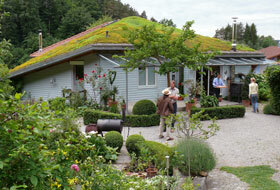 A brightly blossoming Sedum Carpet decorates the roof of this home in Sipplingen, Germany. Green roofs are easily realizable on pitched roofs with slopes up to approx. 30°. Above the streets of Manhattan, tourists meander beside New York joggers along a densely planted trail. To the East, the view of the Hudson River is unimpeded and towards the West, the view is of the hustle and bustle of city life. This elevated park was formerly a freight rail line that was decommissioned in 1980 and forgotten about. However, thanks to an urban planning competition in 2001 that called for the redesign and retention of the New York “High Line”, for the past five years we have had the longest green roof in the world at 2.3 km, right in the heart of Manhattan. Some of the tracks are still visible and the entire structure with stairways is still standing, just as it was in former times. “The New York High Line is a textbook example of how we can convert a concrete jungle into such a wonderful terrain,” says Fabian Kaiser, Director at ZinCo Green Roof Systems Ltd. in Cambridge. ZinCo provided the green roof system build-up for the project. The drainage elements are at the heart of the build-up, providing for a balanced water-air supply, in addition to storing water or drawing it off in the case of excess water. 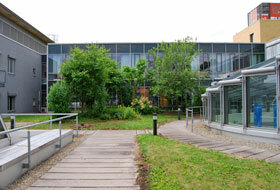 ZinCo, based in Nürtingen (Germany), is a world leader in the field of green roofing. 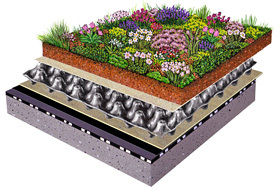 It develops tailor-made solutions for all types of roof use – from environmentally-friendly protective coverings in combination with photovoltaics or roof gardens to pathways and driveways for underground garage roofs. “Our core expertise is in system build-ups for the classic green roof,“ according to Kaiser. The main customers are companies and local authorities. The latter are particularly interested in providing some relief for their municipal sewerage systems which are becoming overloaded due to increasing soil sealing. At the same time, they are aiming to create an urban balance for the green areas that have been lost as a result. 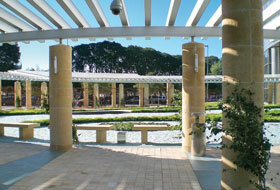 The advantage of green roofs is that they utilize and retain rainwater. ZinCo started out as a plumbing business in Germany, set up by Walter Zink in 1957. The owner spent a lot of time with his company working on roofs because the roof flashing made of sheet metal had to be adapted to fit each individual roof. At some stage the plumber had enough of looking at grey and dreary roofscapes. “Even the architect and artist Hundertwasser was a source of inspiration,” says Kaiser. And, that is how a plumbing business became a driver of innovation in sustainable building. Using the slogan: “From flat roof to roof garden,” in 1972 ZinCo began to develop a wide range of green roof systems in conjunction with third-level institutions and making use of PR work. Since then, ZinCo has repeatedly created innovative products that are informed in particular by ecological thought processes and have become an integral part of their corporate culture. ZinCo has been using recycled waste clay and bricks since 1990 instead of lava rock as the base material for its roof substrate. The production facilities for the substrates which are adapted to suit the conditions in any given country are located in the individual country in order to minimize transport. Yet another milestone for the company was the integration of solar energy use into green roofing. “Solar modules are more efficient when used in conjunction with a green roof. The ideal ambient temperature for solar cells is 25 °C. This is more likely to be achieved from the cooling produced by the green roof due to evaporation than with a gravel roof,” says Kaiser. Another advantage is that the green roof means that the roof does not have to be penetrated in order to secure the solar plant. Research and development are extremely important for the company. ZinCo regularly becomes involved in various projects together with third-level institutions and other partners. For example, comprehensive basic research has been carried out as part of an EU project together with the University of Sheffield. ZinCo not only exports but also has partner companies and branches around the world, even in countries with very specific climatic conditions. “In Iran, for example, increased irrigation is required and the solutions needed there require the additional water not to evaporate immediately,” says Joachim Stroh. And, internationalisation continues apace. “Sustainability is becoming increasingly important for urban planning in conurbations.” The airport in Amsterdam, shopping malls in Turkey, a university library in Warsaw, the Subaru company premises in Singapore, the Repsol-YPF tower in Buenos Aires – the list of international projects continues to grow. The regular exchange of knowledge between ZinCo partners takes place in the form of training courses and every two years the partners also meet to discuss developments on the worldwide market. The company has been awarded a number of prizes for its sustainable and innovative products. In 2008, it was one of the ten winners of the Baden-Württemberg Regional Prize for young entrepreneurs – six years previously four employees of ZinCo had bought out the company – and in 2014 the company was awarded third place in the international innovation competition “Bio-Materials of the Year 2014” for its green roofing system based on renewable raw materials, in addition to the prize “Hidden Champion” in the sustainability category.